Yeah, you might find it hard to believe that these ‘raw-looking’ greens with just little sauce will not taste bitter. But I can assure you, yes, it wasn’t bitter at all. In fact, not even any mild greeny taste. It was, in fact, crunchy and delicious with a hint of natural sweetness! You may need to spend about S$10 to get this dish, from dining out. But now, you will be able to keep your bucks and have this tasted at home. With less than S$2 cost, this Kailan dish will be presented on your dining table, in just 10 minutes! 1) Wash and soak whole leavy Kailan vegetables in lightly salted water for 15 minutes. Boil a medium pot of water over high flame. Add 1 teaspoon of sugar (add more if your pot is large). Blanch Kailan in the boiling water for 1 – 2 minute, or once the leaves appear darker green in colour. Drain on a strainer and place nicely on a serving dish. 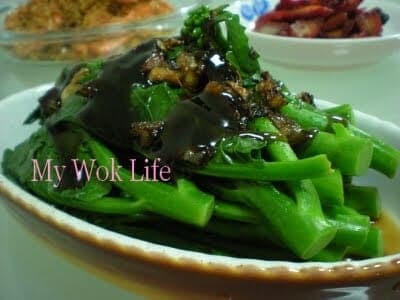 2) Heat wok with vegetable oil on medium heat, stir-fry shallot and garlic till fragrant and browned. Reduce heat to low fire when shallot and garlic are lightly browned to allow standing time. Sprinkle salt and pepper, followed by light soy sauce (beware of its sizzling effect by the mixture of hot oil and light soy sauce). Heat off and immediately pour onto the vegetables. Top sesame oil and oyster sauce. Serve. 1 portion of oyster sauced kailan counts about 120kcal. Variations: Change the choice of vegetables to lettuce or bok choy. Similar cooking method can be adopted on Fish dish or tofu dish. Tips: Choose medium sized Kailan (length of the Kailan should be around the length from the tip of spreaded middle finger to thumb). About 6″ long each. Looks delicious! Long time I didn’t cook this dish.Really admire for your cooking. Iike all of the points you have made. This recipe is fantastic. My family really enjoy this dish. Thanks for the recipe!!! This is my favorite, too! Tried and everyone in the family loves it!